Architect Moshe Safdie rose to international prominence after his very first building, Habitat 67, became the showpiece of the 1967 world's fair in Montreal, Canada. Since then, he's designed buildings around the globe. The first building Moshe Safdie ever designed was Habitat 67. The innovative reimagining of apartment living offered gardens in each unit and was intended to make high volume housing more liveable. Two of Safdie's buildings in Singapore are pictured. At the bottom left of the photo is the Marina Bay Sands ArtScience Museum. Behind that, rising with three graceful towers and a suspended pool connecting them, is the Marina Bay Sands Resort. Located in Kansas City, Missouri, Safdie designed the Kauffman Center for the Performing Arts. Light and space dominate the interior of the Safdie designed Salt Lake City Public Library. As downtown Boise continues to be developed, plans are in the works to build a new library for the City of Trees. With its prime location along Capitol Boulevard adjacent to the Boise River, the public space will be a showpiece for a community that’s growing and coming into its own. City leaders have tapped an internationally-known architect to design what will likely become a landmark. Born in Israel, educated in Canada and based out of Boston for the last 35 years, Moshe Safdie is one of the world’s foremost architects. He’s worked on buildings around the globe ranging from cultural centers and museums to airports and high-density housing units. The self-described practitioner of the world currently has active projects in Brazil, Colombia, Sri Lanka, the U.S., Canada and many other countries. Canada is where Safdie got his start. An architecture student at McGill University, fate smiled on him. As a young student in his 20s, he was tasked with overseeing – and designing – part of a world’s fair that came to Canada in the 60s. Habitat 67. Safdie’s dramatic reimagining of apartment living challenged perceptions of what high-density housing could be. The building is comprised of prefabricated concrete rectangles that connect to form more than 140 apartments. The structuralist design resembles three hills made from an assortment of cement LEGOs. Habitat 67 won international praise and launched the young Safdie into the stratosphere of architecture. Over the last half century, his design sensibility has evolved. Gone is the blocky form of Habitat. Now, many of Safdie’s designs curve, arch and cascade into their surroundings. “My philosophy and approach to architecture – one of my early conclusions which was very much the result of working in contrasting cultures … I realized to what extent it was central to architecture to become resonant with the culture and specificity of a place,” says the 79-year-old. 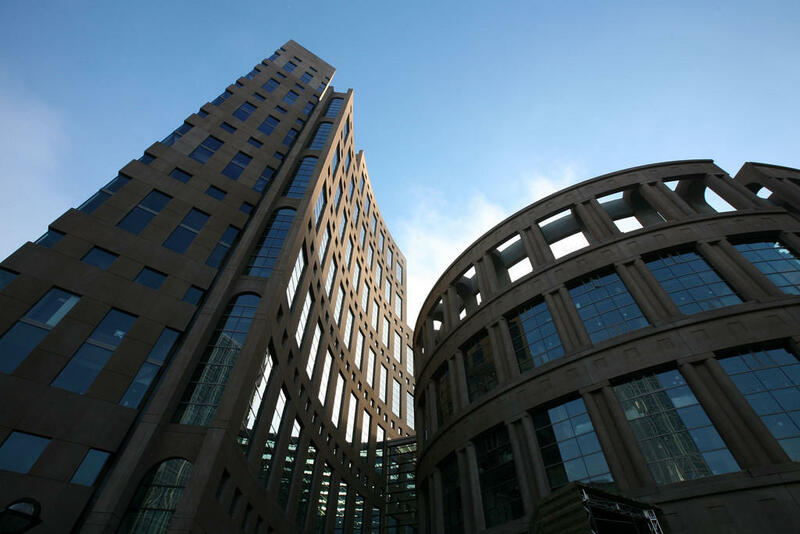 Safdie, who was educated at Canada's McGill University, designed the main library in the west coast city of Vancouver. Staying true to his principle that buildings should reflect their surroundings, Moshe Safdie plans to use the landscape of Boise in his design for the city’s new library. The 110,000 square-foot building is expected to come in at around $70 million and will include facilities for Boise’s Arts and History Department and a public events space. Safdie plans to focus on the structure’s proximity to the river. Located along what Safdie describes as the gateway to the city, he anticipates the building benefiting the entire network of parks that follow the river. Safdie will present his plans personally to the city project committee in May.